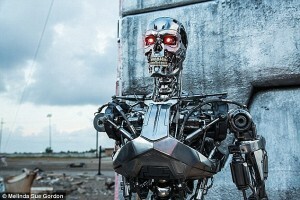 Many fear intelligent droids could become our overlords, like The Terminator. And yet a study has shown we would still trust a robot with our lives in an emergency. The study, by engineers at Georgia Tech, is thought to be the first to study human-robot trust in an emergency situation. ‘People seem to believe that these robotic systems know more about the world than they really do, and that they would never make mistakes or have any kind of fault,’ said Alan Wagner, a senior research engineer in the Georgia Tech Research Institute (GTRI). Overlords– a person of great power or authority.